The blog onorbit.com noticed a nice parallel between Don Pettit’s last photo-shoots and the famous “Stargate Sequence” of Stanley Kubrick’s “2001: A Space Odissey”. “My star trail images are made by taking a time exposure of about 10 to 15 minutes,” said Pettit. “However, with modern digital cameras, 30 seconds is about the longest exposure possible, due to electronic detector noise effectively snowing out the image. To achieve the longer exposures I do what many amateur astronomers do. 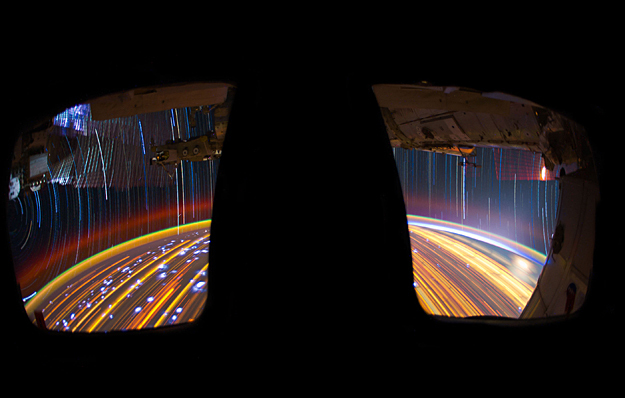 I take multiple 30-second exposures, then ‘stack’ them using imaging software, thus producing the longer exposure.” The image is a composite of 46 images photographed by the astronaut-monitored stationary camera in the Cupola were combined to create this composite. A famous sequence from Stanlay Kubrick’s “2001: A Space Odissey”. A composite of a series of images photographed from a mounted camera on the Earth-orbiting International Space Station (Credits: ESA).